Posttraumatic Stress Disorder (PTSD) which is an abnormal response to extremely stressful event is becoming increasingly common in Sri Lanka. The reason for this increase can be attributed to various social upheavals that we have experienced in the past three decades in our country. The War in the North, the two insurrections in the South of the Country, the increase in violence in households and in the community have all contributed to the increase of PTSD in our society. In addition to man made trauma, we have experienced an immense natural disaster of 2004 Tsunami. This book on PTSD – Shell Shock to Palali Syndrome, PTSD Sri Lankan Experience gives an outline on the development of the concept and discuss in detail the clinical presentation illustrated with many case studies. This book also presents the different methods of management used in PTSD. e author with his clinical experience in medicine and psychology has documented his thoughts about the subject in a simple and reader friendly manner. 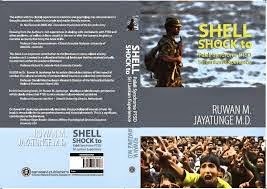 Dr. Ruwan M Jayatunge’s book, “Shell Shock to Palali Syndrome- PTSD Sri Lankan Experience”, is a welcome contribution not only to the PTSD literature but also addresses a current problem facing Sri Lanka. After more than three decades of a devastating ethnic war and the legacy of two Southern ultra-left rebellions as well as facing the massive Asian Tsunami of 2004, Sri Lanka is reeling from the after-effects of trauma. The book clearly describes the development of the concept of Post-traumatic stress disorder (PTSD), early historical antecedents in Sri Lanka and then outlines current management strategies and evidence based treatment options. Coming at this time, the book fulfils the need in Sri Lanka to deal with these immense problems. Dr. Jayatunge illustrates the different presentations with case examples from combatants and civilians that makes it easy to understand the difficult concepts but also helps us to identify with the problems. Drawing from his rick experiences in dealing with combatants with PTSD and other problems, as well as civilians caught in the war or after the tsunami, he gives us narrative accounts that bring the book to life. He deals with the myriad of issues that arise in traumatic situations that affect adults, children and widows who have lost their husbands. He not only looks at the individual disorder but also how families and communities are affected. Not stopping with that he is able to offer solutions and strategies to deal with the problems at an individual, family and community level. We would hope that policy makers and authorities responsible for planning services would take note of his suggestions to provide the necessary rehabilitation and treatment facilities that are desperately needed by these unfortunate victims who have paid the price for the rest of society. Much of the political strife in the world today can be ascribed to the legacy of colonialism. Adept at the Machiavellian strategies of ‘divide and conquer’, the European colonizers purposely pitted ethnic groups against each other. The indigenous groups considered the friendliest to colonizer interests, who offered the least amount of resistance, were singled out for special favors and rewards until they were firmly co-opted to do the colonizer’s bidding. Those who resisted colonial interests most vehemently were targeted for particularly oppressive punishments. When natural factions did not exist within a country, they were often created. As an example, the borders of most African and Middle Eastern states have little to do with traditional boundaries or tribal/cultural territories, but rather are lines drawn by the colonial powers for their own convenience. As but one example, we have a nation like Iraq containing three geographically separate and culturally very distinct groups, Kurds, Shiites, and Sunnis, with long histories of unresolved rancor between them. These divisions severely eroded the unity in the indigenous societies that were often simultaneously devastated from disease, warfare, forced removals, loss of homelands, mass killings, and policies of ethnic cleansing. The tremendous harm caused by generations of factionalism, as a direct consequence of colonialism, cannot be overstated as it has greatly affected the capacity of indigenous cultures to mobilize broadly for significant change. Accordingly, Bessel van der Kolk has argued that history is written in blood. Today’s ethnic hatreds and civil wars are in great part the legacies of our colonial history. In this heartbreaking and detailed work, we are introduced to Sri Lanka, a country described by the author as beautiful and highly literate, an earthly paradise that has been deeply traumatized, on a multigenerational level, by political violence and inhuman atrocities for more than thirty years. In addition, on December 26, 2004, the people of Sri Lanka were struck by an immense and devastating tsunami that took more than 30,000 lives and displaced nearly 545,715 of the country’s inhabitants. Judith Herman has noted that psychological trauma is an affliction of the powerless that is perpetrated by the powerful. At the moments of trauma, all victims are rendered helpless by overwhelming force. When the force is that of nature, we speak of disasters. When the force originates in other human beings, we speak of atrocities. In either case, the prominent characteristic of the traumatic event is its power to inspire helplessness and terror. Sri Lanka's Eelam war that lasted for nearly 30 years, has its roots in hundreds of years of ethnic rivalry and the resultant long-standing political acrimony between the majority Sinhalese and the minority Tamils. As we have seen in similar situations in Africa, the Middle East, Northern Ireland, Southeast Asia, and post-iron-curtain Eastern Europe, the resultant centuries-long buildup of resentment and hate, the products of divide and conquer, create posttraumatic cycles of hate, retribution, and more hate. This type of chronic PTSD, often ignored or denied, is inevitable and defies culture. It is the catalyst that launched the Eelam war and the thirty-year cycle of atrocities that are chronicled in this book. In the three decades of armed conflict in Sri Lanka, the victims of terror have been profoundly affected psychologically and socially. The impact can be seen at the individual, family, and community levels. Epidemiological surveys have shown that soldiers and civilians have experienced widespread traumatization, with high levels of somatization, anxiety, depression, Posttraumatic Stress Disorder (PTSD), relationship problems, and alcohol abuse. At the community level, the cumulative effect of the horror has been a collective trauma, with a general propensity to mistrust, dependence, silence, withdrawal, passivity, and lack of motivation. Socially, there is evidence of deterioration in values and ethics with marked increases in child abuse, violence against women, crime, and brutalization. These phenomena are driven by trauma, not culture. Recent epidemiological studies suggest that with the increasing rates of trauma worldwide, PTSD is on track to become a major global public health problem. Yet, despite its wide prevalence, PTSD continues to be relatively under-recognized, with proper diagnoses complicated by stigma, comorbidity and symptom overlap, rigid onset criteria, and questionably high diagnostic thresholds. Post-traumatic symptoms that do not meet the threshold for a diagnosis of PTSD are often accompanied by significant functional impairment, a condition referred to as partial or sub-threshold PTSD. Interestingly, research studies have shown that the occupational and social impairment observed in partial PTSD rival those reported its full PTSD, yet most individuals with partial PTSD remain untreated. The author concludes insightfully that although war ended in 2009, the psychological repercussions of the war have not. This is evidenced by the psychological reverberations of the Eelam War in Sri Lankan society. Murders, suicides, rapes and child abuse have increased over the past few years. There is a palpable presence of alienation, mistrust and culture of silence prevailing in the post-war Sri Lankan society. The war stress especially the posttraumatic reactions of the Eelam war will echo in the Sri Lankan society for many generations unless appropriate psychological measures to heal the nation are taken. History has shown us very clearly that neither the passage of time nor culture, alone, have the capacity to heal these wounds. The men and women who wage war in close combat situations are typically not among the few who make declarations of war or negotiations of peace, yet they are among the many that carry the heavy psychological burden of war. In his carefully documented book, Dr. Ruwan Jayatunge, brings us a unique perspective on the experience of PTSD by focusing on its manifestations in Sri Lanka. He coins the term Palali Syndrome to capture the importance of a pivotal military location for many victims of trauma brought about by the Eelam war. Dr. Jayatunge uses a series of case studies of combatants in the Eelam war to illustrate the complexity of the many manifestations of PTSD related experiences. His observations, however, are not limited to the Eelam war. Among the topics on offer, we find a historical analysis of PTSD experiences, PTSD experiences following the 2004 Tsunami, and the treatment of PTSD. This book is an important contribution to the literature on stress related anxiety disorders as it is rooted in a cultural and historical landscape that has received virtually no attention within the academic literature. KUDOS to Dr . Ruwan Jayatunge for his astute clinical descriptions of the impact of combat . His cultural sensitivity of combat-related trauma is a welcomed contribution. He not only highlights the universality of war -related trauma , but he also points to ways to provide treatment , nurture recovery and bolster resilience. "In this fascinating book, Dr. Ruwan M.Jayatunge describes Sri Lanka’s recent history of war, political unrest and natural disasters. Presenting many case examples, he pays special attention to the traumatizing effects of these events in military servicemen and civilians, including women en children. By relating his findings to historical, as well as contemporary clinical and cultural studies of combat trauma and PTSD, he develops a caleidoscopic perspective which clearly shows that PTSD is not a western culture-bound syndrome. However, it also highlights the limitations of PTSD as a trauma-related diagnostic category. In an era in which transcultural perspectives on trauma are increasingly valued, this book is a most welcome contribution to the field—one that should be read by all psychotraumatologists." Dr.Ruwan M Jayatunga persuasively describes the psychological wounds of war. His book is remarkable for its comprehensiveness and historical research. This is a significant contribution to the literature. Dr Ruwan M Jayatunge has articulately analyzed the previous denial of PTSD in Sri Lanka, historical aspects in the world and in Sri Lanka as well as cultural and religious aspects to the connotations of this analysis. In my research there were many child combatants of the LTTE with PTSD. He has also looked at the manifestations of PTSD through perspectives of culture and religion. This book also looks at the importance of therapy using culturally appropriate methods which we too found useful after the Tsunami. This is a fascinating book for experts as well as trainees to read. This is a book of great scope and detail that raises profound historical, ethical, and political questions regarding society’s continuing difficulty in recognizing the pervasiveness of trauma and the resultant recycling of anger and retribution in its history.